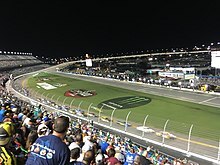 The 2018 Coke Zero Sugar 400 was a Monster Energy NASCAR Cup Series race held on July 7, 2018 at Daytona International Speedway in Daytona Beach, Florida. Contested over 168 laps -- extended from 160 laps due to an overtime finish with two attempts for the first time since 2011, on the 2.5-mile (4.0 km) superspeedway, it was the 18th race of the 2018 Monster Energy NASCAR Cup Series season. Erik Jones scored his first career win in the Monster Energy NASCAR Cup Series and for the first time in a decade, Toyota and Joe Gibbs Racing had won a July race at Daytona. Daytona International Speedway, the site of the race. Clint Bowyer was the fastest in the first practice session with a time of 44.821 seconds and a speed of 200.799 mph (323.155 km/h). Final practice session for Thursday was cancelled due to rain. Chase Elliott scored the pole for the race with a time of 46.381 and a speed of 194.045 mph (312.285 km/h). NBC Sports covered the race on the television side. Rick Allen, 2000 Coke Zero 400 winner Jeff Burton and two-time Coke Zero 400 winner Dale Earnhardt Jr. called in the booth for the race. Mike Tirico and Steve Letarte called from the NBC Peacock Pit Box on pit road. Dave Burns, Parker Kligerman, Marty Snider and Kelli Stavast reported from pit lane during the race. MRN had the radio call for the race which was also simulcast on Sirius XM NASCAR Radio. ^ "2018 schedule". Jayski.com. Jayski's Silly Season Site. May 5, 2017. Retrieved June 3, 2018. ^ "Daytona International Speedway". NASCAR.com. NASCAR Media Group, LLC. January 3, 2013. Retrieved June 3, 2018. ^ "Entry List". MRN.com. Motor Racing Network. July 3, 2018. Retrieved July 3, 2018. ^ "First Practice Results". MRN.com. Motor Racing Network. July 5, 2018. Retrieved July 5, 2018. ^ "Qualifying Results". MRN.com. Motor Racing Network. July 6, 2018. Retrieved July 6, 2018. ^ "Coke Zero Sugar 400 Results". MRN.com. Motor Racing Network. July 7, 2018. Retrieved July 7, 2018. ^ "Points standings" (PDF). Jayski.com. Jayski's Silly Season Site. July 9, 2018. Retrieved July 9, 2018. ^ "Manufacturer standings" (PDF). Jayski.com. Jayski's Silly Season Site. July 9, 2018. Retrieved July 9, 2018. ^ "Daytona final TV ratings". Jayski's Silly Season Site. ESPN. Retrieved 2 October 2018. ^ Reed, Steve (January 22, 2013). "Daytona International unveils plans for upgrade". sports.yahoo.com. Yahoo! Sports. Archived from the original on January 25, 2013. Retrieved June 12, 2017. ^ "Daytona Rising". Daytona International Speedway. December 5, 2013. Archived from the original on December 5, 2013. Retrieved June 12, 2017. ^ Utter, Jim (July 5, 2018). "Clint Bowyer leads Ford armada in first Cup practice at Daytona". Motorsport.com. Daytona Beach, Florida: Motorsport Network. Retrieved July 5, 2018. ^ "Elliott gives Hendrick, Chevy needed boost with Daytona pole". Associated Press. Daytona Beach, Florida: AP Sports. Associated Press. July 6, 2018. Retrieved July 6, 2018.